"But Mary treasured up all these things and pondered them in her heart..."
Tony Vega found himself in a very uncomfortable situation last week. Having just dropped off a bus load of children, Tony returned to lock up our Fairview facility for the night. As he walked up the church steps, a group of tough teens surrounded him, wanting to fight. "Guys," he pleaded, "I really don't want any trouble." They weren't interested in negotiations. In a provocative gesture, one blew smoke in his face. Now Tony is no novice to urban ministry. He grew up in Camden. But this was making him nervous. And there was no one around to help. Then, out of nowhere, came a shout from down the block. "Tony! Tony! Is that you? Is that really you?" Within seconds, a young woman bounded up the stairs and embraced Tony like a long lost friend. "You know this guy?" she said, turning to the group, who she obviously knew. "This is my old counselor. He's the greatest guy in the world. I used to be in his AfterSchool program." Within seconds, the tension dissolved, and the teens apologized and moved on down the street. "Molika saved me," confessed Tony in a later conversation. "She dissolved a potentially violent situation, just because she knew me and knew those guys. She made peace." 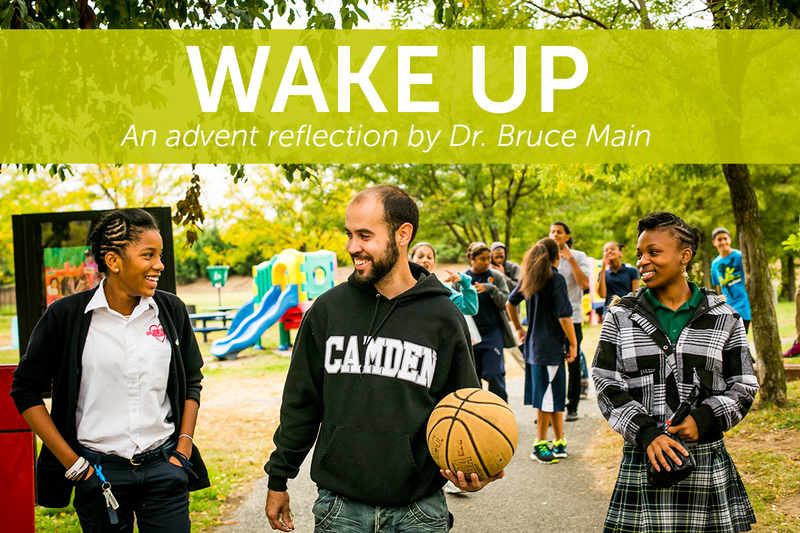 A pastor recently described the Advent season as a trip to the gym to work on our spiritual attentiveness. Once a year, he reminded the congregation, we need to wake up, start paying attention, and stop sleepwalking through our lives. He challenged us to pay attention to what God is doing in our midst. So how do I prepare for Christmas? How can I really take advantage of this special season of Advent that calls me to a greater awareness? One way is to ponder some of the key themes of the season—joy, peace, generosity, and wonder—and then intentionally look for expressions of these realities throughout the day. Perhaps these are the gifts God really wants to give me this season. So I find myself looking for expressions of joy, moments of peace, acts of generosity, and bursts of wonder. And when I see these often-overlooked expressions of the season, I try to receive them as a gift. Like any treasured gift, I slowly unwrap it, hold it, look at it from different angles, and maybe even write down how the gift makes me feel. Tony's experience was an early gift, certainly to him but also to me. It reminds me that peace is possible, even in potentially volatile situations. It reminds me that God sometimes shows up in the most unusual places. We just need to be ready to recognize His gifts. 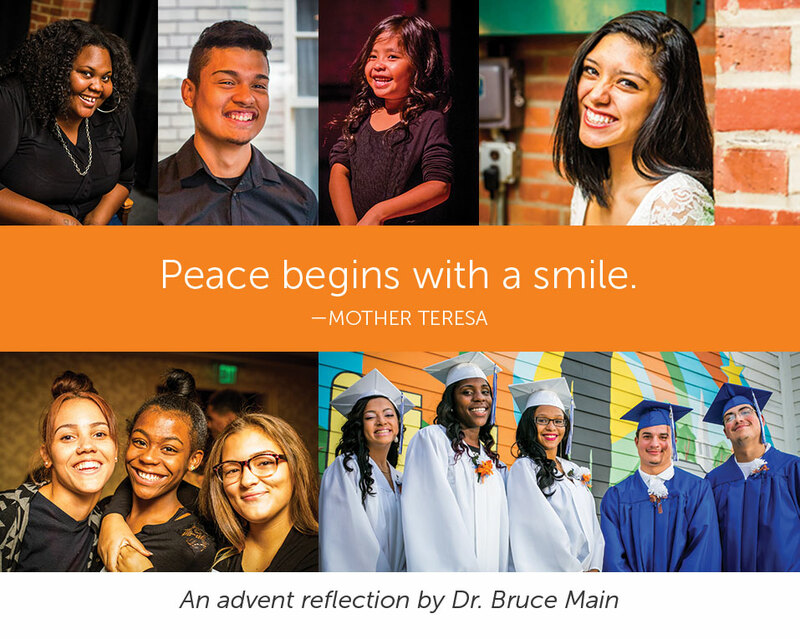 Have you seen an expression of peace, joy, generosity today? What would it mean to receive it as a gift? Everyone sat still, eyes riveted on the two teenage girls at the front of the room. I wrote this letter because I needed to forgive my older sister," confessed the first teenager. "She used to tell me that I was ugly, that I was a mistake, and that I would never amount to anything. My anger towards my sister was destroying me." And then this brave teen began to read her heart-felt letter of forgiveness. She talked about the pain her sister caused, her consequent feelings of worthlessness, their troubled relationship, and that she wanted to forgive her. "I forgive you," she ended. "I don't want hate to live in me." These teenage girls are part of a girls’ group that meets once a week under the direction of our StreetLeader coordinator, Aleisha. The purpose of the group is to create a safe place where young women can bare their souls, a place where they can find healing and learn to forgive. "I just noticed that there were all these girls with broken relationships," recalls Aleisha. "In order to move ahead with their lives, they needed to forgive. Some girls have written 10 letters to the same person. Forgiveness, I'm learning, is a process." Listening to our teens read their letters of forgiveness reminded me of the courage it takes to really bring peace into the world. Peace takes work, because peace begins with our own lives. We can't be instruments of peace if we're not committed to healing the unrest in our own lives first. Peace begins with us. Advent is a time to reflect on the Prince of Peace coming into the world. In the coming days, we will sing songs about peace, pray for peace, and recite verses about peace. Let us find inspiration from these young women, who model for us the courage to forgive, so we can find peace in our own lives and the share it with the world. There is a lot of fear going around these days. Peaceful Parisians are gunned down while dining with friends. A plane of unsuspecting tourists explodes in the air. A Christmas party for coworkers ends in carnage. Fear is real, and it's easy to let it control us. The late Catholic writer Henri Nouwan once wrote that there are two houses in which people can dwell: the house of fear or the house of love. This metaphor can guide for our decision making and thinking: Will our decisions be based on fear or love? According to Nouwan, we need to continually challenge our fears, not allowing them to define and control us. We need to live in the house of love. When founding UrbanPromise 28 years ago with a small group of college volunteers, people asked me: "Aren't you afraid? Camden is the most dangerous city in America!" At that moment, our little community had to choose the house in which we were going to dwell. Sure, there were fears, but would those fears define us? Would we face the negative statistics, the stereotypes, the economic outlook through a lens of fear, or a lens of love? We chose love, because love ultimately brings life, healing, unity, and peace. And that's exactly what we've seen over the years at UrbanPromise. 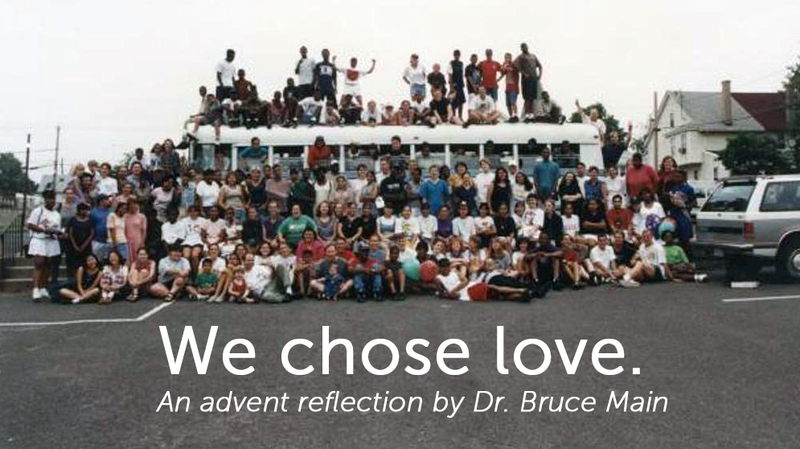 Within the Christian tradition, Advent is a time to prepare to meet God's greatest gift of love to the world. A gift that promises peace. Jesus came into a real world—a world where fear was rampant. Yet Jesus, the Prince of Peace, chose to dwell in the house of love. It shaped the way he saw people, where he traveled, and ultimately, the way he responded to those who feared him. His path was and is always the way of love. How do my fears limit me? Am I living in the house of fear or the house of love? What is one way I can challenge my fears today? 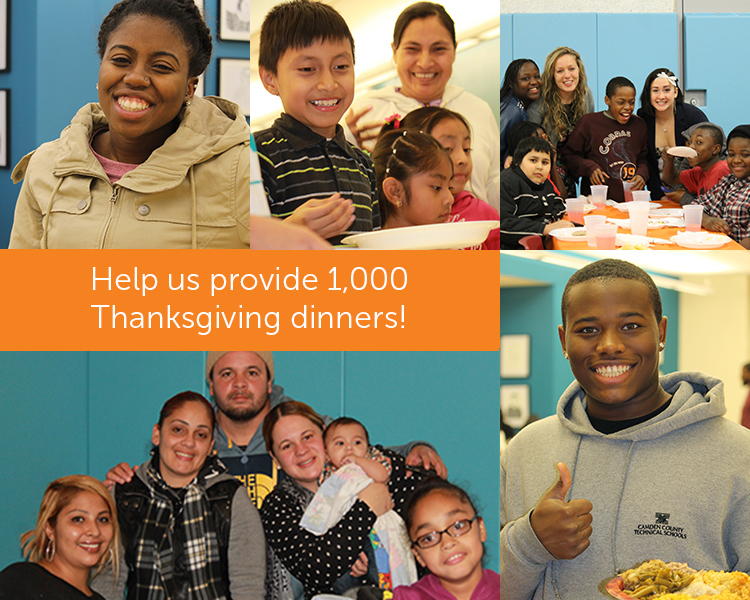 This week hundreds of youth and their families were served a delicious Thanksgiving meal at UrbanPromise. Another 141 families were blessed with a turkey and food to take home and cook for their family and friends on Thanksgiving Day. There was fellowship, dancing, great food, singing, laughter, and a new favorite this year - a Connect Four tournament after dinner. Because of you we have had an amazing week! 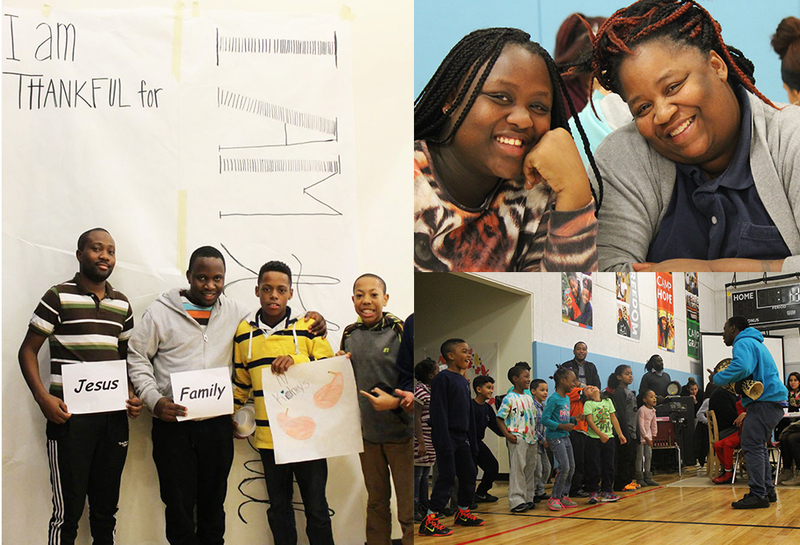 On behalf of the children, youth, families and staff of UrbanPromise we wish you a Happy Thanksgiving. Special thanks to the following groups that organized volunteers to serve, cooked food, collected turkeys, or gave monitory donations. Association Headquarters, Moorestown High School, Lockheed Martin, Cathedral Kitchen, Safety Bus, Logan Memorial Presbyterian, St. Charles Borromeo, Colorstone Gardens, as well as our individual volunteers and donors! Imagine the opportunity to make a low risk investment that could yield a million dollars? StreetLeader graduate and current UrbanPromise board member Arlene Wube has done this 43 times. 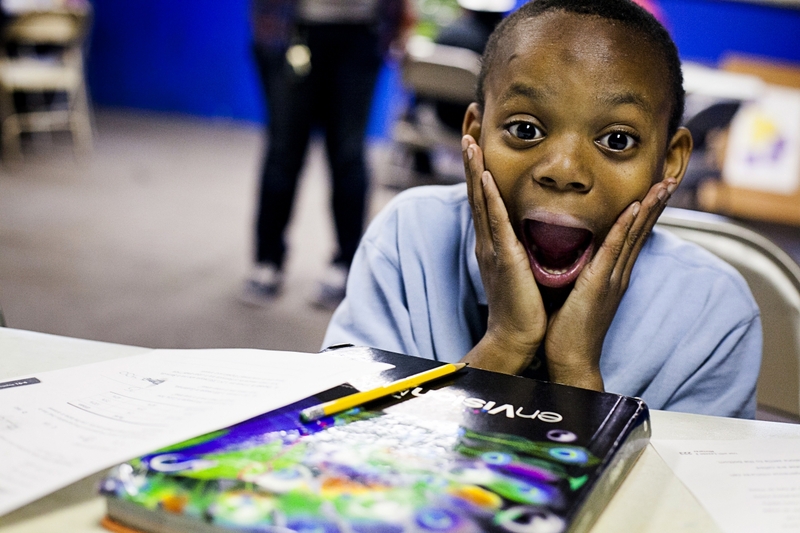 I’ll tell you her secret, which she learned from an UrbanPromise donor. Arlene had a dream to enable young people from Camden to attend college. It was a dream that grew out of her own experience: she came close to dropping out her second year of college due to the gap between the college bill, financial aid, and her ability to pay. 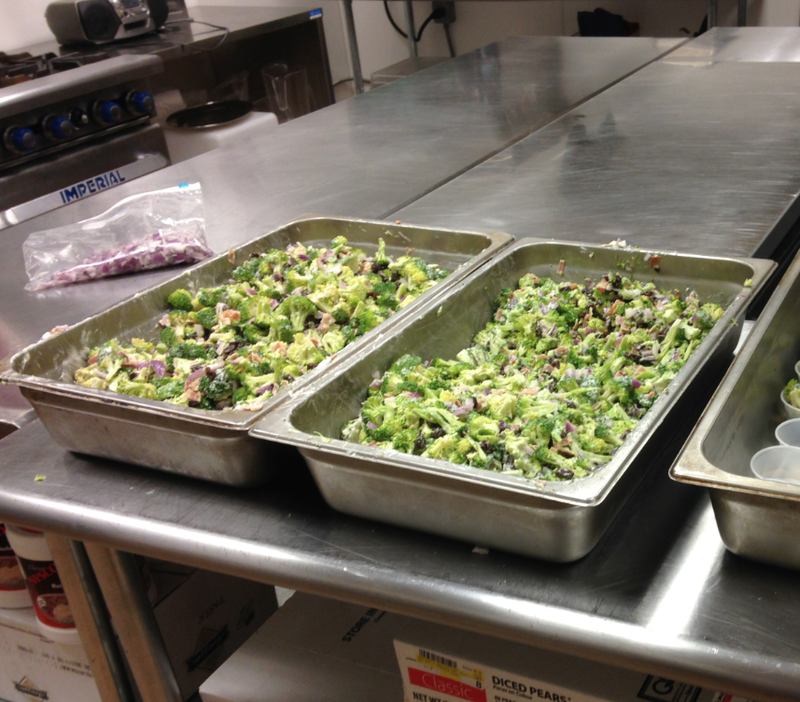 However, an UrbanPromise donor made up the difference. She graduated from Howard, went onto get her MBA, and is now a proud business owner, mother, and wife living in Washington, DC. In 2011, she started the UrbanPromise Ambassadors of Hope scholarship fund. Thanks to Arlene’s dream and hard work, UrbanPromise has been able to fill the financial gap for 43 of our high school graduates since that time. These 43 students have gone on to college, and 100 percent have either graduated from college or are still in school today. This is an amazing outcome that surpassed our hopes. Our young people are grateful for your investment in them, and they are working hard at college. They are making the most of their opportunities. They are spending their free time teaching elderly people ESL, as Natasha Santiago is doing at TCNJ. They are leading mentoring groups for African American men, like Dominic Bowman is doing at Montclair. They are earning good grades, like Mecca Perry, a 4.0 student. They proudly report their grades (because we require it). They commit to remaining drug and alcohol free, and they come to speak to our children during their breaks. They are taking all that they’ve learned at UrbanPromise, and they are continuing to help others by making a difference with their lives. They are making us proud. However, it is also true that not having book money or not having a meal plan can be the difference in a student’s success or failure. For the first time in 4 years, our scholarship fund balance is not enough to meet the needs of 27 of our college students for the upcoming school year. Our gap is $45,000, which will cover scholarships ranging from $500 to $8,000. Please consider helping. 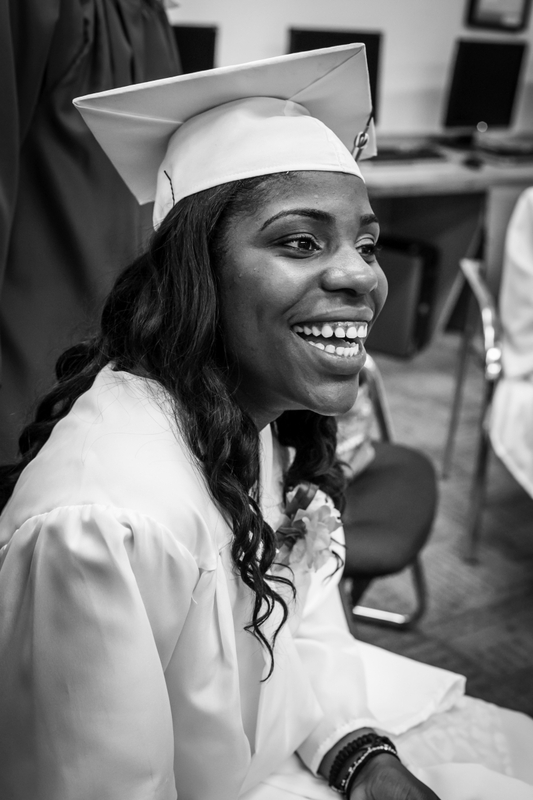 Every dollar you invest in an UrbanPromise college student will yield a phenomenal return: the lifetime earnings difference between a college graduate and a high school graduate is a million dollars! Please join Arlene in making a million dollar investment today. This summer I was in charge of over 30 teens and 180 campers at UrbanPromise. I made sure camp went well and was running properly. I also mentored teens and built relationships with them. Thanks to UrbanPromise’s support, my sister and I were able to go to college. I graduate this year. 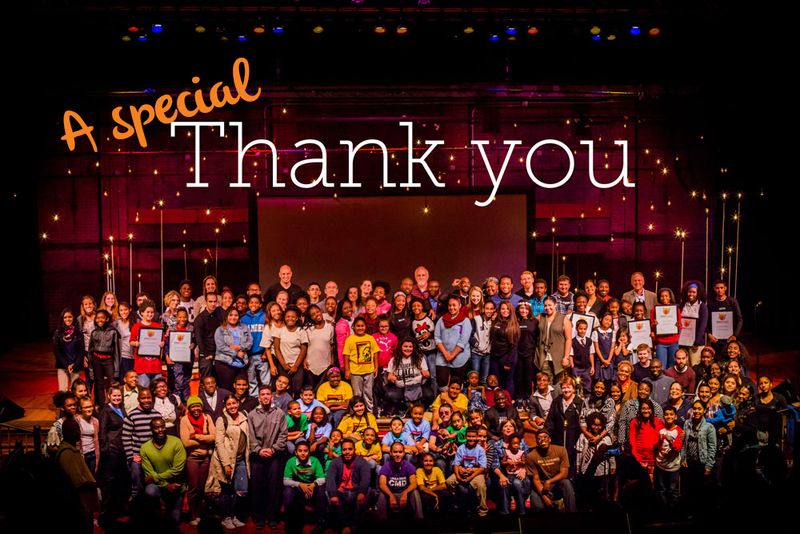 I’ve had the pleasure and honor of being involved with UrbanPromise for 6 years. In those years, I’ve been a camp kid, volunteer, and StreetLeader, all of which have shaped me into the motivated, level-headed man I am becoming. My experience with the StreetLeader Program was one of the best experiences I have ever had … During my first year of college I realized books are really expensive, and one of the hardest things for me to purchase during college. UrbanPromise helped me buy my books. Thank you. I have been a part of UrbanPromise since first grade. UrbanPromise helped groom me not to become a statistic. This is my first year as an independent student due to the sudden death of my mother last year. I am hoping UrbanPromise can provide some financial help so I can keep going. My relationship with UrbanPromise is unconditional. It is my second family. I will always help out at UrbanPromise, because they gave me a great start. Every Sunday night during the summer, our summer college interns/missionaries gather on Sunday night for worship and sharing. They share stories from the week, some of them pretty funny. Most of them are about how they see God working in Camden, in the kids, and in themselves. I dread the last weekend of our summer program: interns are crying, kids are crying, StreetLeaders are crying. This past Sunday night was our last time to gather for worship. After 7 weeks of pouring every bit of themselves into the program, it was time for our 35 interns to say good-bye to Camden and the children they had come to love, and it was heart wrenching. The sharing time started slowly. No one wanted to get in front of the group and break down. But little by little they did. One by one, they shared about the kids who changed them. They recalled wanting to come to Camden to change the city, and instead found themselves changed by the love the children gave to them. Then Sam stood up and shared about Juju, a 9-year-old boy at Camp Saved. Juju had won the Most Improved Camper award. I was struck by the realization that every summer for the past 5 years, I’ve heard intern stories about Juju. In 2010, I heard about Juju as a 4-year old, playing in the streets and riding his bike through downtown. The interns during the summer of 2010 were shocked that this little boy could be seen anywhere from the waterfront to south Camden on his bike, by himself. They made an exception and let him into Camp 2 years before our starting age. The summer staff of 2011 fell in love with Juju, and his antics at camp kept them laughing. They would compose lesson plans with him in mind, inspired by the challenge of creating Bible and art lessons that would get him to listen. They began having him over for dinner; they went to his house to meet his mother. The summer interns of 2012, 2013, and 2014 shared regularly about the challenges, growth, and progress they saw in Juju. As our interns depart this week, we are grateful despite our tears. Because of your support and the willingness of young people to give a summer or school year of their lives, children like Juju continue to be loved and nurtured. They too will become Most Improved Campers, and they will have cherished memories of young college students who loved them and gave them everything they had to give.